I’m working with fewer and fewer network client implementations of InforCRM, but every once and a while, an interesting little issue pops up. I recently found an issue with the Custom Settings area in the Administrator Application. There is an interface in the Administrator application to allow the Admin to set various defaultvalues, including this one. The issue I bumped into is that it only allows you to set a boolean default to “True” or “False”, while in ICRM, boolean values are stored as “T” or “F”. Why is this an issue? Well, on the Insert New Account Contact form in the network client, there is some code that looks for a default value for the “Do Not Solicit” field in the CustomSettings table. It will either use the value found, otherwise a value of “T” is hard-coded as the default value. 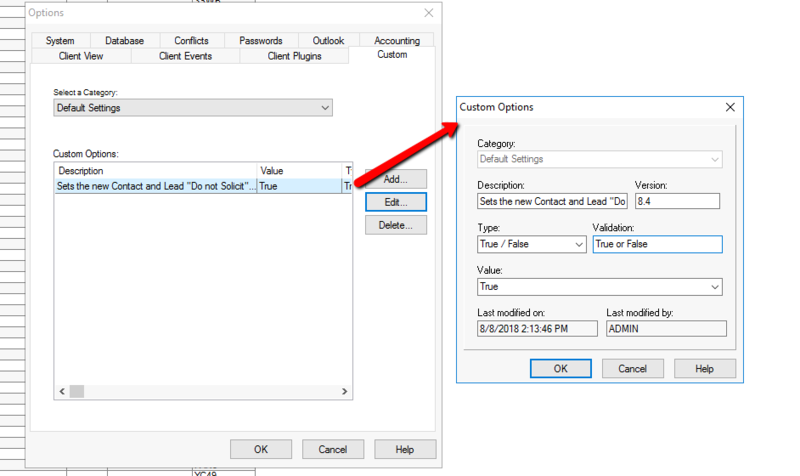 In this case, if you change the DoNotSolicit default in this interface to an allowed value of “True” or “False”, that will result in errors being thrown when adding a new contact. In order to fix this, you have 2 options. First, you could just track down the offending setting in the CustomSettings table, then using TSQL, change the DataValue field in that table to the correct, single character value. Alternatively, you could change the Type value of the Custom option to “Other”, which would allow you to enter the correct value directly in that interface. There are a number of default settings available to be changed from that interface, some of which are used for integration into other systems. I’m sure that for some of those, “True” and “False” are appropriate, but for “booleans” in ICRM, it doesn’t quite work.